How many boring weddings have you been to this year? You know, the kind where you go to the church then immediately to the reception, cringe over the food, dance to the same old overplayed wedding tunes, and forget the details in 3, 2, 1. I imagine more than you probably would have liked to. So let me guess… when you and your significant other started to talk about wedding planning, you decided you wanted something different than this traditional wedding nonsense. Your adventurous, avid travelers, and are seekers of moments, not things. You yearned for an EXPERIENCE, not just a wedding day, right? Then you stumbled upon the idea of having an adventure wedding in Iceland… BRILLIANT. DONE. SOLD. Woohoo! Now that you’re planning a wedding in Iceland with guests (and not eloping in Iceland), you need to devise a plan so that your Iceland wedding day is going to go down as: THE WEDDING OF THE YEAR. So how do you do that successfully with or without an Iceland Wedding Planner? Create a wedding website with useful information that makes it easy for your guests to make the decision to come (IE, Why you chose Iceland for your destination wedding location, Accommodation Room Block Information, Rental Car Info, Things to Do, How to Drive in Iceland, What to Pack, What to Wear to an Iceland Wedding Day, Best Hot Springs, Your Iceland Wedding Day Schedule, Pre/Post Wedding Itinerary, Gift Registry, etc). Get Your Guests EXCITED to come! How? Send a little “gift” with your invitation (like a map of the island, Icelandic candy, etc). Send a newsletter update via email at the 9, 6, 3 and 1 month away marks to formally connect with your guests (also helps you track your room block information, meal choices, and reminds your guests that you care about them having an unforgettable time when they come to your Iceland wedding!). Take your honeymoon 3-6 months after your wedding in Iceland so that you can design an epic pre and post wedding adventures WITH your guests in tow. After all, you CHOSE Iceland for some fantastic reasons, so show them the best of the island (your way)! Even if many your guests are not as adventurous as the two of you, they will live vicariously through you and feel honored to participate at different points. When your guests check in to your Iceland wedding hotel, have welcome bags for them (either have the front desk give to each guest at time of check-in OR ask your fabulous Iceland Wedding Planner or Hotel if they can put them into each guests room). Iceland Wedding Welcome Bags can have things in it like… Water, Tissues, Antacids, Tylenol/Advil, Hangover Kit, Hand Lotion (check out Soley products), Hand Sanitizer, Pepto-Bismol, Breath Mints, Shout Wipes, Chapstick, Eye Mask and Earplugs (if getting married in Iceland during summer solstice), Snacks (peanuts, cliff bars), Umbrella / Rain Poncho, Local Icelandic things like (dried fish jerky, licorice, chocolate, a wool item, map, or other awesome party favors). Hold a “Welcome” Dinner or Cocktail Hour the day before your Iceland wedding day. It gathers and focuses people. Plus, it builds the anticipation of embarking on your adventure wedding day in Iceland! Have a signature drink, either Icelandic (or American) appetizers OR a full sit-down 3 course meal. If doing appetizers and drinks only, I suggest a 5-6pm timeframe. If doing dinner, then start at 7pm (30 minutes per course). NOTE: It’s important for people to GET SLEEP, so be mindful of this. 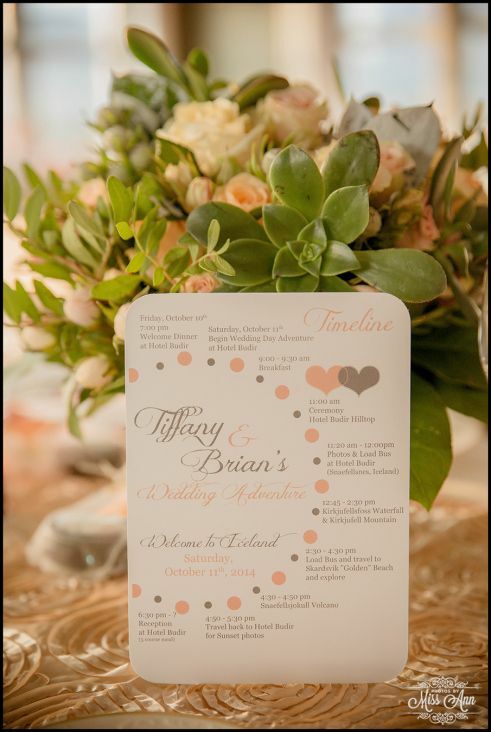 At the beginning or end of the welcome event pass out a physical Timeline Card/Schedule to each guest. This is critical so that everyone is fully aware (no excuses) of when and where they need to be. No one wants to be “that guy/gal” who shows up late, holds everyone up, or ruins an itinerary. Set your guests up for success (and less stress) by communicating the schedule to them. See here or here for an example Iceland wedding timeline card. Allow us to design a full day adventure for your Iceland wedding day. The landscape is unforgettable and being able to explore it with your guests is unlike anything they will EVER experience. Imagine yourself saying “I do” at a private waterfall with zero tourists, discovering secret caves, marveling over massive glaciers, green mountains, trekking through canyons, and secluded black sand beaches with stunning rock formations! Say what?! Um yeah, seriously. Your guests will be left speechless by the end of the day. Seat your wedding guests during your Iceland wedding ceremony. Nothing worse for a guest than having to stand through a ceremony in the cold/wind/rain, etc. So be kind and courteous to their needs since they came all that way! See HERE for more information on that topic. Have an Unplugged Wedding Ceremony. Why? See our previous blog post HERE to understand better. It encourages your guests to be PRESENT and in the moment WITH YOU. Your guests may be miffed for a hot second but in the end, it will prove to have a larger impact on them, I promise. Have a scheduled “bail out” point if needed during the day (if your guest list includes any children under 10, over 70 years old or just in general less adventurous fair weather folks) AND a designated “rest” time between the adventure portion and the reception dinner. At least an hour is needed for guests to be able to rest, refresh, and catch a second wind. They will thank you later for this! Introduce your Iceland wedding guests to some cultural elements! Craft your wedding menu to have some local delicacies such as the following: Mushroom Soup, Icelandic Meat Soup, Langoustine, Scallops, Arctic Char, Reindeer, Lamb, or Skyr Cake. Adding in an Icelandic Wedding Cake is a fun option as well! Save any speeches or toasts for after the main course. Toasts are best enjoyed by everyone on a full belly. Have an open bar (unless there are sensitive circumstances as to why you cannot). It’s not very pleasant for a guest to have travelled thousands of miles to find out their “friends” cannot buy them a glass of wine or a beer. But know it’s okay to have curved limits like stating on the bottom of your menu “Beverages: Sodas, Coffee, Tea, Beer, and Wine” which implies cocktails or hard liquors are on the guests’ dime. Or telling the hotel it’s okay to have an “open bar” if bottles or 30-year-old whiskies, etc are not included. Just be tactful about it and not tacky to save a few bucks. Be sure (if you have not hired us as your Iceland wedding photographer) you specifically ask your Iceland wedding photographer to take candid and posed photos (of the couples). It’s a nice keepsake for you and the couples to have and remember later! Schedule some post wedding day awesomeness for you and your Iceland wedding guests. Maybe an activity like Inside the Volcano? Glacier Ice Climbing or Hiking? Horseback Riding? Scuba or Snorkeling between the famed tectonic plates? Or how fun would it be for you all to caravan with walkie talkies throughout the Golden Circle and end the day in some secret hot springs?! It would be an unforgettable end to your wedding events! Send “thank you” notes to your guests regardless of them sending you a gift or not. That simple. If they came to your Iceland destination wedding, they deserve to be “thanked” for coming formally. Do it within 6 weeks after your Iceland wedding day. Following these easy straightforward steps will ensure your guests are happy during your wedding day in Iceland and them remembering yours as THE BEST DAY EVER!